orchid care and specializes in growing orchids using hydroponics. If you’ve been thinking about starting to grow orchids hydroponically, this a wonderful place to learn all about the hydroponics system. I highly recommend you check out his site Hydro Orchids. Jeree: In 1990 I started growing tropical plants hydroponically for our corporate interiorscape business. Soon after that I began experimenting with growing orchids hydroponically. Just like any new orchid grower, I had my successes and I had my failures. But I have to tell you, growing orchids in our system quickly became a success! We have been in business 25 years and have been growing orchids (hydroponically) for 15 years. 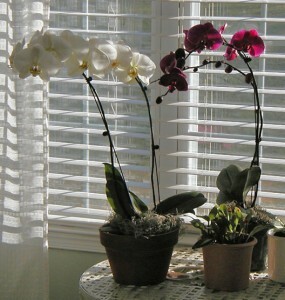 Ryan: What are the advantages of hydroponic growing for orchids? 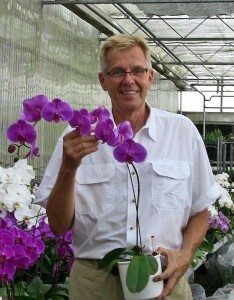 Jeree: Growing orchids with hydroponics has many advantages. First, special clay pebbles replace all other growing media. They’re clean, easy to use and never compact or decompose which promotes better air flow to the plant’s roots. And you never have to repot because your growing media breaks down. Next, a water gauge tells you when to water (or NOT to water) – taking the guesswork out of watering ( the #1 killer of orchids). With hydroponics, your watering schedule changes to once every 2-3 weeks, perfect for people who travel. Ryan: What’s makes your particular hydroponic method unique? Our system uses a “Two Pot Growing System”. An inner grow pot (or culture pot) holds the plant and is designed to encourage maximum air flow over the roots. Then, a decorative outer pot acts as a reservoir, holding the nutrient solution for the plant. This two pot system dramatically improves the air flow around the plant’s roots. It also gives you better control over how much water the plant is getting because you can dump out all the water and force a dry period if necessary – which can be important with growing orchids. Most hydroponic systems use some form of clay aggregate as their growing medium. We have found that the properties of clay aggregates can vary widely. We import special clay pebbles from Germany called LECA (Lightweight Expaned Clay Aggregate) that outperform all the rest. They’re cleaner, support the roots better, and have superior capillary properties – the engine that makes our system work. Ryan: What’s a common mistake people make when they grow orchids hydroponically? Jeree: The most common mistake people make with hydroponics is over-doing it. With our system plants practically take care of themselves. Watering schedules change from every couple of days to once every 2-3 weeks. You need to have the courage to stand back and let the system do its work. Take the guess-work out of watering! Ryan: For someone that grows orchids the traditional way, why should they consider growing with your materials? Jeree: All the different potting materials that commercial growers use can make watering a tricky situation at home. An orchid growing in moss probably needs water only once every 2 weeks. That same orchid growing in bark might demand water twice a week! This can be confusing and watering quickly becomes a guessing game. With our system, there’s no guesswork because a water gauge tells you when and how much to water. Our system is life saver for people who travel because the watering is typically once every 2-3 weeks. Think of it this way – with traditional growing methods the only way your plants can get water is, of course, when you water them. That can put you on a demanding schedule. With our system, you simply fill the reservoir and the wicking action of the LECA pebbles automatically delivers an even mix of water, nutrients, and air to the plant gently and evenly – no matter what your schedule is. That’s the power of LECA pebbles and hydroponics! Product Recommendations to Get Started? Ryan: What products/items can you recommend if someone wants to get started and try growing their orchid(s) hydroponically? Jeree: Growing orchids hydroponically in fun and easy! The best place to begin is our Hydroponics Starter Sets*. We have put together everything you need to transfer two plants to hydroponics, including step by step instructions. Then, after you gain some experience with our system you can move to buying individual components as needed. *Orchids Made Easy Green Thumb Club Members save an ADDITIONAL 20% off the prices on that page. Simply use the current coupon code in the members area. Ryan: Do you grow orchids? What’s your favorite orchid and why? Jeree: My orchid collection might not be what you think! Let me explain. Rather than seeking out that rare species of Cattleya that only grows above 3500 ft . and no one in our orchid society has seen before, I choose simple orchids that will enhance the living and working spaces in our home and office. That means they must be easy to grow, display colorful flowers for weeks at a time, and be able withstand our hectic travel schedule. To make it into my collection, an orchid has to be a durable grower and a reliable bloomer year after year. I have about 30-40 (okay, maybe 50) plants that are simple hybrids that you could probably find at any garden center. When a plant starts to bloom, I “dress it up” in a decorative container along with other tropicals, or maybe another orchid for a bigger display. Then, I move it from its growing area (in our case a greenhouse) to a spot in the house or at the office where everyone can enjoy the display of colorful blooms. Our arrangements make quite a show at home and at work. We enjoy Cymbidiums and Phalaenopsis throughout the winter, Oncidiums in the spring, and Dendrobiums most of the summer. And they’re all grown hydroponically of course! Jeree: I enjoyed talking with you today! I feel fortunate to be able to have a business doing something I love. We get lots of positive feedback from our customers. It’s rewarding to help people enjoy their plants. I understand the satisfaction of “getting it right” and seeing your orchid bloom with your flowers. Even after all these years I’m still excited about the possibilities of hydroponics and how it can help hobbyists become more successful growers. Thank you for inviting me on your blog.